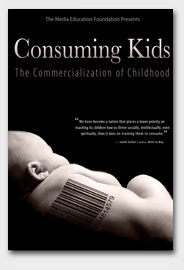 April 16, 2010 About a year ago, TruthOut featured a poignant article called “Commodifying Kids, The Forgotten Crisis” by academic Henry A. Giroux, and though I read it with lots of head bobbing agreement on the tipping point of toxicity, I have to strongly DISagree with the “forgotten” notion. This issue is not the LEAST bit forgotten…it’s on fire, baby and it’s gaining huge momentum. Now add on other like-minded nonpartisan, non-censorship, non-religious based middle-roaders dedicated to reclaiming childhood from cruddy credos served up in our current pop culture and hey, we’ve got ourselves a movement in the making. Like? Adproofing Your Kids and Healthy Media Choices and Common Sense Media and Parents for Ethical Marketing and a whole slew of “I’m not a prude, but…” teens, parents, and advocacy orgs that prefer media and marketing live up to its fullest POSITIVE potential! But it’s so much more than the switch pitch of counter-marketing by replacing damaging drek with healthier cues…It’s about mass media mindshifting for public health, (girls AND boys) for the long term societal socio-emotional landscape. Naaaaaah…We’re just getting this party started! Just this week alone we’ve seen mainstream media focus on the need for critical thinking skills and media literacy about messages to kids being lobbed into the cultural zeitgeist…The NYT mag’s body image piece, “The Fat Trap,” the Daily Mail/UK report about retail giant Primark ditching padded bikinis for 7-year olds in their stores, and blogger moms like PigtailPals sounding off about Candie’s and the thong-ization of 10-year old tweens. In fact, lately, I’ve served on several PTA/parent education panels starting to connect the dots between all sorts of ‘commodification’ blowback (from thug-wannabeism and branded hypefests to crass, coarse cues where media is defining kids before they can define themselves). Some of the focus is finally even spotlighting the rising stress and pressures on BOYS (which if anything, seem to ME to be one of the most ‘forgotten’ portions of the media conversation, which we’ve addressed repeatedly in the Packaging Boyhood blog series). More evidence people are tiring of profit-mongers undermining parents and going ‘digital direct’ to tease out crummy behavioral cues from kids craving attention and the almighty fame factor? Next month a bunch of us concerned about profit margins going ‘ka-ching’ while kids’ psyches go ‘ka-boom’ (advocacy orgs like HGHW, Women’s Media Center, True Child etc.) are convening in NYC to see how we can turn this tanker around and share best practices. And… the week after that, I’m flying to L.A. to meet up with amazing advocates like Jess Weiner to see how we can leverage Hollywood ties in L.A. and get industry people embedded and onboard some culture shifting. With teens, we shift into hands-on fun, as it fits nicely into Earth Day themes, swap-n-shop clothing trades for a win-win eco message, or using financial literacy and business acumen as a consumerist teaching moment with other media literacy life skills. Or…using the screening as a way to instill peer to peer ‘aha’ moments, like this post “Screen a movie, make a difference” (using examples from film showings on school nutrition (Two Angry Moms documentary) or Byron Hurt’s Beyond Beats & Rhymes about hip-hop influence and who’s controlling the purse strings there (big hint, not African Americans or muscians!) we’ve found media itself to be a phenomenal way to end observation and cogitation and move forward into activation…compelling. Tuesday I’ll bring samples of how we work with K-5 kids as ‘junior advertising executives’ using art projects with music, magazines, markers and more to ‘create’ a brand and learn how they’re being ‘targeted’ by marketers and how to deconstruct the messages with media literacy insights. 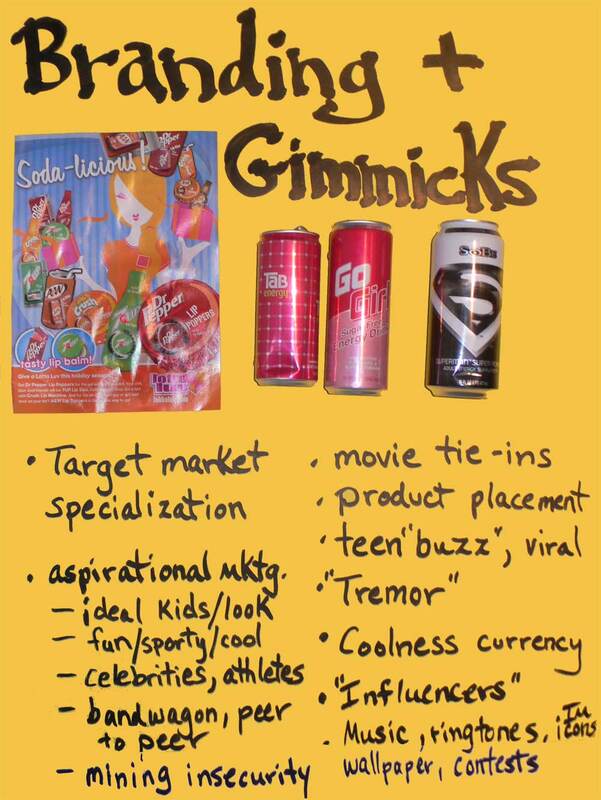 They learn about label lingo, name generation, how ads appeal to kids with color, sound, endorsements and heroes to shield themselves with knowledge and help their peers do the same. For both kids AND adult audiences, I like to go online to demo how we show K-5 kids to be powerful ‘CIA agents’ (cyber info advocates) exploring their favorite sites and playing hide and seek with the commercial messages embedded throughout the digital arena. (e.g. design your own cereal box online using ref sites like pbskids “Don’t Buy It” or the FTC “You Are Here” consumer site set up as a shopping mall, the newest FTC media literacy offering: Admongo.gov or my favorite show-n-tell evidentiary blitz from recent campaigns at DigitalAds.org. So if you want to expand the conversation and join us on Tuesday as we screen a 6:30pm showing of Consuming Kids followed by a guest panel of Q&A with yours truly (Amy Jussel) & other parent education leaders, we’re asking all attendees to RSVP on the Brave New Theaters free site for headcount…Click here! Powerhouse girl advocates Rachel Simmons and our own body image expert Dr. Robyn Silverman team up for a FREE teleseminar asking parents to sound off on their most pressing problems raising kids with the media. The films pack a powerful punch for insights into youth culture and media/marketing’s implicit role in the need to create healthier messaging and a brighter worldview for kids. We MUST use the power of media for positive change…for with power comes profound responsibility. Can Somethin’ Be Done About All This Consumption? Seven Sensational Blogs About Girls: All Things Girl Week Part Two, Finale! Are We Making Matters Worse By All the Body Image Chatter? America the Beautiful- Documentary: See It. Support It. ATB Review + “How Much Do You Pay For Beauty? Film Screenings: ATB Tonight in Marin, Consuming Kids, June 4th!